It was another agony and pains for residents of Makurfi, Benue State capital on Wednesday as several communities in the town were buried in water. This is coming three days after some parts of the state capital was flooded on Sunday. 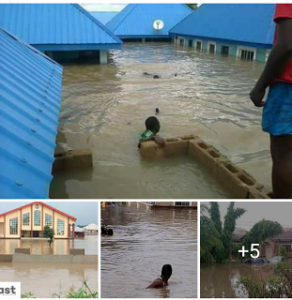 Several parts of the state which included Media Village at Achusa, Wurukum, Naka road, Wadata, Nyinma, Welfare Quarters were all submerged in the five hours down pour which has rendered several persons homeless. Journalists were the worst hit in the Wednesday down pour as the media village at Achusa was completely submerged rendering them homeless. The rainfall started around 12.24 a.m. and lasted till 5:00 a.m., it rendered Achusa-Nyinma- Welfare quarters completely submerged. The only access road linking the three communities is completely flooded which has prevented vehicular movement. Part of the public places buried in water along the major road were; Trinity Hospital and Hotel Lucia through Natal Community to Achusa. Also affected is the Living Faith Church at Naka road, with several houses within the area completely buried in water.